"My ally is the Force, and a powerful ally it is. Life creates it, makes it grow. Its energy surrounds us and binds us. Luminous beings are we." In just 144 pages, the Star Wars: The Roleplaying Game core rulebook opened the way to boundless adventures among the stars, and its rules systems are as fast and effective as ever. All you and your friends need to enjoy this seminal roleplaying experience are the core rulebook, pencils, paper, and a bunch of six-sided dice. The rulebook, meanwhile, is broken into three sections, each of which is divided into a number of smaller, focused chapters. In the Player Section, you'll find everything you need to understand how the game allows characters to interact with each other and their environment. The rules for character creation are clearly presented and make it easy to design every type of Star Wars character you could imagine, from an aspiring Jedi to a rogue freighter pilot, from a grizzled soldier to a secretive politician. The Gamemaster Section further fleshes out the game with insight into all the things a gamemaster needs to run his or her players through fully realized Star Wars adventures. You'll find a useful introduction to gamemastering alongside detailed rules for starships, combat, wounds and healing, and using the Force. Finally, the Adventure Section steps back to look at the art of designing and running adventures in such a way as to make them truly entertaining and memorable Star Wars experiences. Then it jumps head first into the fully realized adventure "Rebel Breakout" before it presents a range of other adventure ideas you and your friends might pursue on your own. Of course, it's the Star Wars universe that draws us to this game, and the rulebook acknowledges this fact with a plethora of photo stills and concept art, plus some fantastic and comical, retro-styled advertisements that get you into the mindset of one of the galaxy's countless citizens. Also weighing in at 144 pages, The Star Wars Sourcebook offers a wealth of information about the starships, vehicles, creatures, alien races, Rebel bases, and Imperial garrisons that can help ground your games fully within the Star Wars galaxy. The book is divided into fifteen chapters: General Spacecraft Systems, Starfighters, Combat Starships, Space Transports, Droids, Repulsorlift Vehicles, Imperial Ground Assault Vehicles, Aliens, Creatures, General Equipment, Lightsabers, Stormtroopers, Rebel Bases, Imperial Garrisons, and Heroes and Villains. These are accompanied by dozens upon dozens of charts, photos, pieces of concept art, schematic diagrams, and short fiction. This means that The Star Wars Sourcebook does more than simply help you populate your games; it provides a deeper insight into the Star Wars universe, itself, along with many of its various legends. And as a relic of a bygone age, The Star Wars Sourcebook serves as a beautiful reminder of these legends, allowing you to enjoy them and recall an earlier time in the history of all things Star Wars, even as the newer films, television shows, comics, and novels blast us forward into the galaxy's future. The Jedi were nearly extinct and all but forgotten, but they returned to change the galaxy. 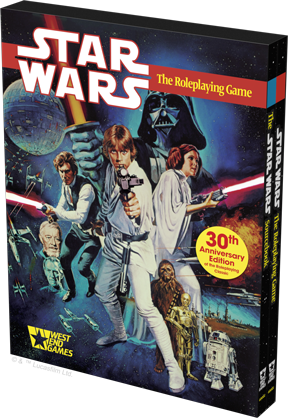 Now, thirty years after West End Games first published Star Wars: The Roleplaying Game, its books make their return in this highly collectible 30th Anniversary Edition. The Force binds them It flows through them. And they can bring the Star Wars galaxy to life on your tabletop, in your minds, and in your heart, now as much as ever before. There's no better way for you or your favorite Star Wars fan to celebrate the fortieth anniversary of Star Wars than with this enduring piece of Star Wars history! The rules and reference materials presented in the Star Wars™: The Roleplaying Game 30th Anniversary Edition are not compatible with , , and . 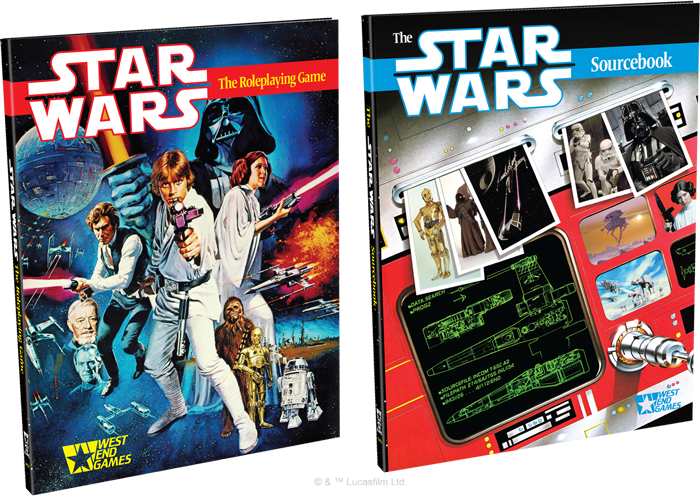 The Star Wars: The Roleplaying Game 30th Anniversary Edition is being made available as a collectible piece of Star Wars history, intended to stand alone.